Goshiwon is a form of housing that has been in South Korea for more than 40 years. It started as cheap, temporary accommodations for students who spend years studying for difficult state and bar exams, known as goshi in Korean. The flats usually consist of cramped rooms less than five square meters, with a communal kitchen and bathroom. As housing prices rise in Seoul, goshiwons have evolved to find a broader clientele. Some are more clean, spacious, and even “minimalistic” — an euphemism for the bareness of the room — and claimed the ironic name of goshitel (goshiwon+hotel). Such names became interchangeable, sometimes deceivingly. Soon not only students, but poorly paid office workers began seeking refuge in various forms of goshiwon or goshitel. According to the former National Emergency Management Agency (now integrated into the Ministry of Public Safety and Security), there were 11,457 registered goshiwons across South Korea in 2014, 6,158 of them Seoul. Factoring in illegal, unregistered goshiwons, the total number must be greater, and the number of people living in goshiwons may be ten to twenty times that figure. 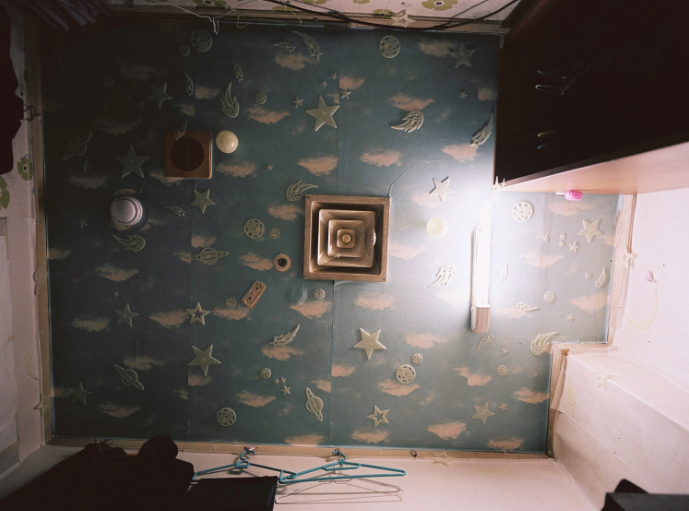 South Korean photographer Sim Kyu-dong, 29, lived in various goshitels across Seoul for more than three years. Born and raised in the port city of Gangneung in Gangwon Province, Sim came to Seoul to find work during leaves of absence from school. Without money for a lump sum deposit for a studio — in South Korea, a big deposit is necessary to secure a rental — goshitel was his only housing option. Sim’s photo book on the goshitel is coming out in late April from South Korea’s photo book publisher Noonbit. He is running a crowdfunding campaign to exhibit the photos at the South Korean National Assembly in May. Follow him on Facebook and Instagram. Jun Michael Park is a documentary photographer and visual storyteller from South Korea. Jun is represented by laif Agency and available for assignments.